Starbucks Mumbai review: Strictly OKAY coffee, good food and could-do-better seating. There’s so much hype surrounding Starbucks that I, like many others in Mumbai, just had to check it out. But I decided to wait for the excitement to die down to avoid standing in a long queue to enter The Coffee Shop. So, I went there on a weekday and after spending a good an hour and a half in the coffee shop, I still can’t understand why would anyone want to wait over 30 minutes to get into this place or take pictures of its every nook and corner, behaving like star struck Bollywood fans. Starbucks serves you beverages disposable cups with your name written on it and one wannabe friend of a friend actually took a picture of herself with the cup and kept the cup as a souvenir for a good week at his work desk, till a colleague who couldn’t stand her admiring a week old used coffee cup anymore, crushed it and threw it in the bin. Yes, Starbucks mania has hit coffee fans in Mumbai. I am a coffee fan and love sitting in coffee shops for hours together. As I gather, most people like me, looking to spend lazy evenings with friends in a coffee shop want comfort, relaxing ambience, good coffee and decent food to match in the outlet. Here’s what we liked about the Starbucks standalone outlet at Horniman Circle, Mumbai. 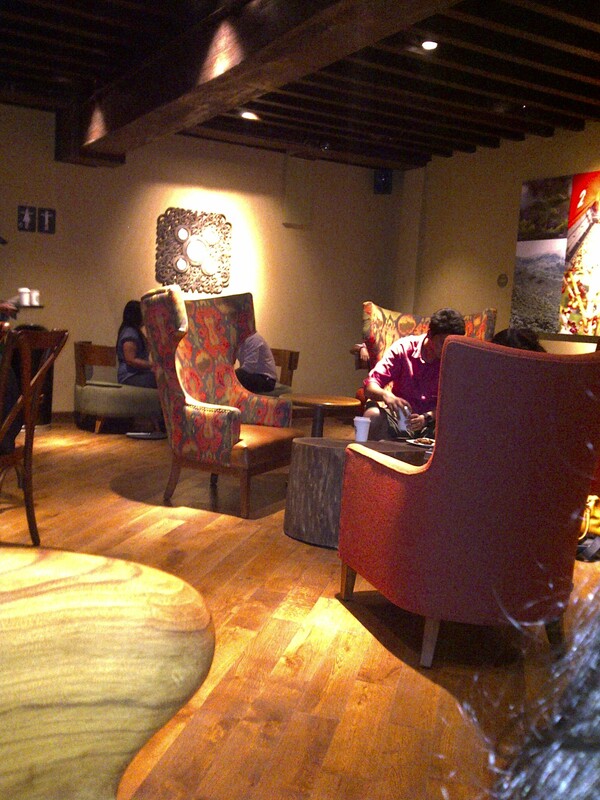 * The ambience is very tavern like, laid back, rugged and casual. Coffee mugs, cups and beans up for sale are neatly dumped in large containers. * Lights, yellow, are dim and muted. * The outlet is spacious, with a mezzanine level too. * The staff is friendly, courteous and have mastered the ‘I’m-ever-ready-to-help-you-out’ look on their faces. * The menu has interesting options and most of them deliver on the taste front too. * The Salmon and Cream Cheese Croissant is yummy. 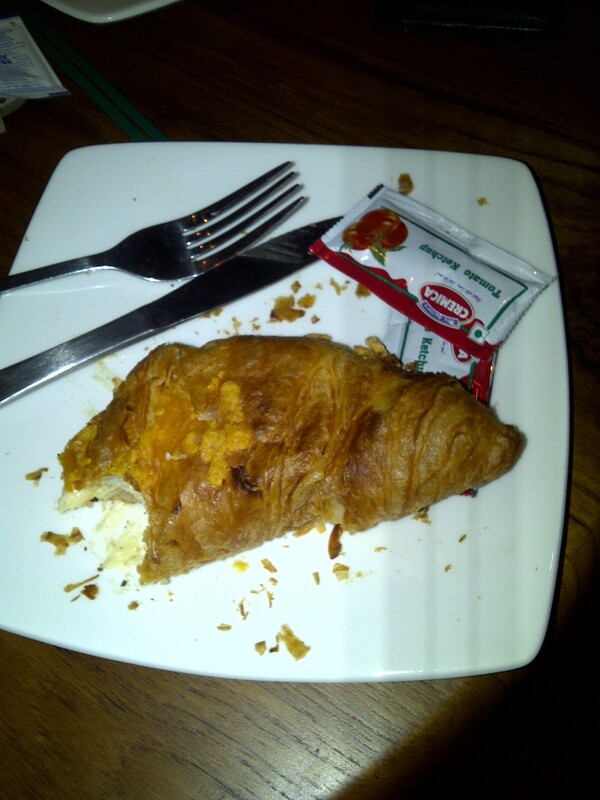 Priced at Rs 130, the croissant is soft and oozes thin layers of cream, cheese and bits of salmon into your mouth. Sharing this croissant is highly recommend because a) it’s stuffed with cheese and cream – distribute the calories. b) all that cream and cheese makes you feel stuffy in no time. 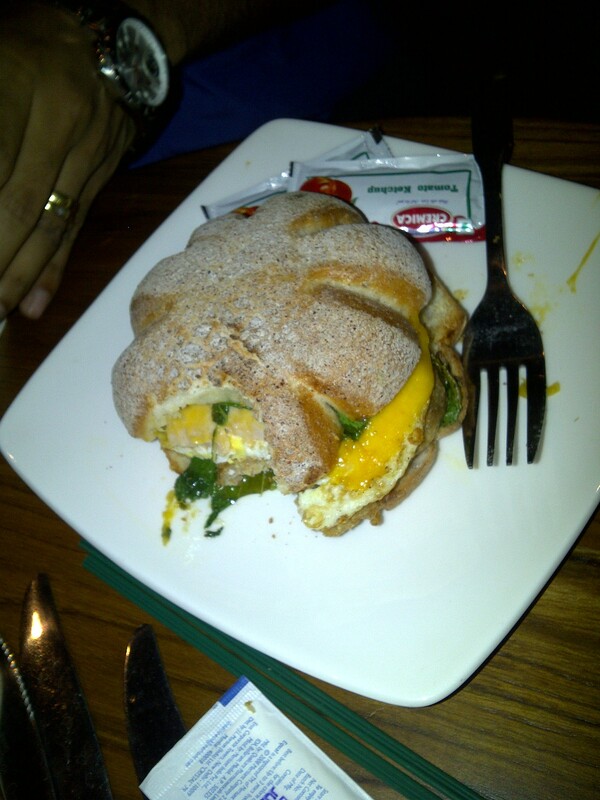 * Star Club Sandwich — a star shaped burger of sorts, has egg, chicken patty, cheese and a layer of green leaves in it. One of my favourites from the menu, it balances all the elements excellently. You can have an entire one by yourself and still be game for more. Rs 160. 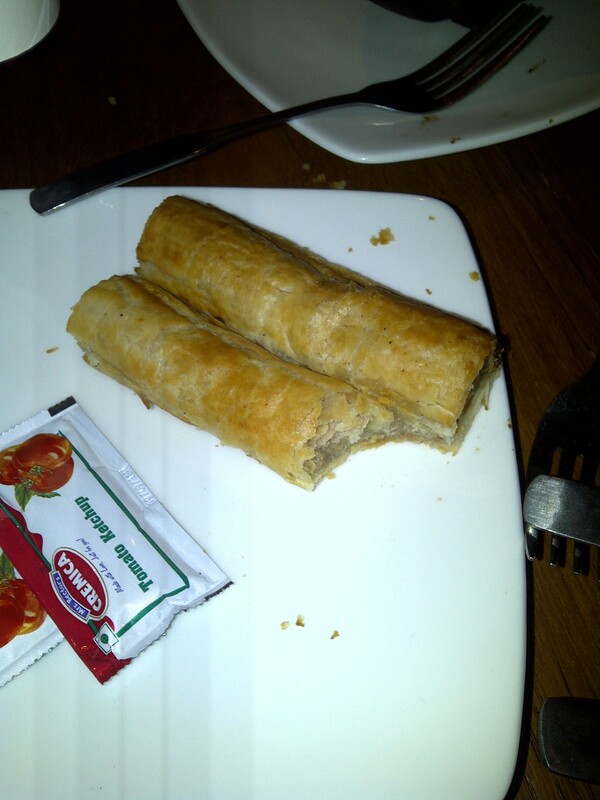 * Twin Barrel Sausage Roll, Rs 90, is sausage rolls with flaky exteriors. A bland sausage taste envelopes your mouth with each bite, so have it with ketchup to avoid feeling bored. * There is only one billing counter, which means a never ending queue to place your order and another one to collect the beverage! * The seating styles are weird and uncomfortable. Some tables have regular chairs around them, while some have majestic wide-width ones circling them. These chairs are so far apart that you can’t help but notch up your volume a few decibels more than what is considered decent and invite stares from fellow patrons. * The Vanilla Latte and Caramel Macchiato taste identical or so similar, you can’t tell one from the other. We were tempted to ask for a replacement, but the thought of standing in that ever growing queue to even get an opportunity to talk to the staff made us gulp down the twin beverages, without a sound. * The music. It’s a coffee shop. It’s Starbucks. Don’t make us feel like we’re in the lobby of a 5-Star hotel. Play some peppy numbers, pleaaaaase. * Ooh!!! And my friend and I spotted a couple of tiny creatures hovering in the coffee beans container near the blenders. By the time we could draw our fellow companion’s attention to them, they disappeared. We’re still wondering if we were the lucky recipients of coffee with insect juice in it that evening! Guess we’ll never know. Sigh! Bottomline: Starbucks… just another friendly neighbourhood coffee shop.